Lake Orta is situated in the foothills of the Alps. See Lake Orta on Google Maps (opens satellite view in new window) At the south end of the lake there are low hills, at the north end the mountains are much higher (the Mottarone is nearly 1500 metres) and the distant Alpine peaks can be seen. You are well above the heat and haze of the Po plain, and the general effect is of a much gentler - and more inviting! - landscape, compared with some of the larger alpine lakes. And Lake Orta remains a bit of a hidden gem, being not particularly well known, even though it is the "next lake along" from Lake Maggiore. One of the traditional local occupations is hotels and restaurants - waiters and chefs from Lake Orta work all over the world - and the local people have hospitality in their blood! A major local industry is up-market mixer taps, so you may want to take the opportunity to visit the Alessi factory showroom at Crusinallo (TimeOut review), or the tap museum in San Maurizio d'Opaglio. For the holidaymaker, the beautiful scenery, amazing local villages, great beaches, superb walking, easy access to the Alps the other Italian Lakes and the Ligurian coast, and the wonderful and very reasonably priced local restaurants all make for a fantastic stay at Lake Orta. Lake Orta has had some glowing press coverage from journalists that have discovered the lake. Glowing article in The Sunday Times (2nd September 2018) about Lake Orta, read it here. The UK Guardian (3rd August 2016) names Lake Orta as one of the 10 best places to swim in the world, read the article here. Penny Smith discovered (and was 'intoxicated' by) Lake Orta, writing in the UK's Daily Mail (25th November 2012), read the article here. The New York Times published (23rd September 2012) a piece on Lake Orta, the Secret little Sister, by Bonnie Tsui. Bonnie stayed in one of our apartments, Venere, and it's from there she set off for her epic swim! Read the article here. Travel writer Lee Marshall wrote in the UK's Telegraph (27th July 2012) why Lake Orta is his "personal favourite" among the Italian Lakes, read the article here. Lake Orta featured (10th March 2012) on the front page of the travel section of the UK's Guardian, read all about the beauty and secret that is Orta in Edward Docx's article. A similar article was published 2 weeks later in Australia's The Age (24th March 2012), entitled 'Cinderella, a secret fairy tale'. Read the article by Edward Docx here. Read Linda Cookson's piece on Lake Orta from the UK's Independent (29th January 2005), saying Lake Orta is "awash with mystical history and stunning villages - yet is largely unknown". Read the article here. Rest assured that it is still relatively unknown and still just as much the magical place that this article so beautifully describes! 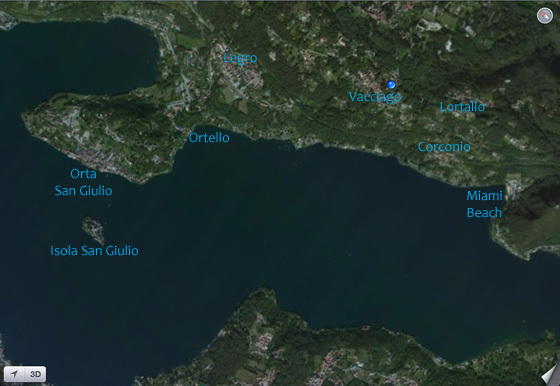 See live webcams of Lake Orta?